In my 38 years around the markets, or for that matter, in my lifetime, I don’t think we have ever had a more economically disrupting president than we now have in Donald Trump. To be upfront, I have a very low opinion of his basic intelligence, his lack of integrity and his narcissistic approach to dealing with people and issues...but this newsletter is NOT a political platform and do be assured that everything I write here truly has a single principal purpose: To attempt to understand where various markets are headed (and why)…and then to present recommendations that hopefully will result in money making trades. To that end, I have to make mention of Trump, and my perception of him, as he, more than any president in history, has definitely become a MAJOR factor in the pricing equation of any number of market sectors. Again, NONE of my trade ideas have ANYTHING to do with my personal feelings about Donald Trump. ALL I care about is getting it right in the markets. GLOBAL TRADE WAR is just stupid. China will NOT be cowered. They will NOT back down. I think that any ideas that China needs the USA more than the USA needs China, and that President Xi Jinping is likely to timidly accede to Donald Trump’s demands are wrong…and I therefore believe that any upping of the ante in the form of tariffs (or whatever latest impulses DT has) are ONLY going to be met by equally strong Chinese responses, one of which is already being DISASTROUSLY felt in the agricultural community here in the USA, wherein just about every farmer in this country has recently seen their revenues slashed by approximately 15-20%...in just the past few weeks…And unfortunately, I suspect that it’s going to get much worse for rural America before it gets ANY better. Just to be clear as to how bad it really is, on the charts following, check out the real world devastation that is taking place if you are a farmer here in the USA…And just imagine what it must feel like to have your income slashed like this, virtually overnight…with prices now having mostly fallen BELOW your cost of production. And these will all look like GIANT moves…because they truly are…and again, they have all happened, literally within a matter of weeks. And let’s get real, NONE of this was anticipated by the great art-of-the-deal maker…And if this doesn’t change soon, and DRAMATICALLY to the upside, you will definitely be looking at a lot of bankruptcy in Agricultural America…a LOT. I can imagine just about anything…both positive and negative. Believe what you want to politically…but I maintain that virtually no one on the international leadership scene trusts DT at all…that his “word” is worthless…and that it is a FACT that he has alienated ALL of our allies (and buddied up to our enemies), the possible result being that when/if WE get in trouble…when/if the Chinese DON’T bend for Trump…and when/if the consequences begin hitting harder here in the USA…the idea of all of our longstanding allies unifying to support us is NOT something I think anyone should be expecting…You reap what you sow, and while business is business, I don’t think there is anybody in the industrialized world (beyond Russia) who would now go out of their way to lend the USA a commercial hand. Again, this is NOT a politically inspired notion on my part. This IS the reality that has been created by the current president. However, while I think all those conditions are still the major driving force in a global expansion that I see continuing for the foreseeable future, for the first time in years, due to the unknown impact and ramifications of Trump’s Trade War, I am wondering if stocks and the economy have now become vulnerable to some degree of a contraction…BUT…not to the extent that I am ready to shift to a bearish posture regarding equities and the fate of the world’s economies, my feeling being that the longstanding upward GLOBAL economic expansion may be bigger than Donald Trump’s hopefully momentary disruptions…But the truth is, I DON’T KNOW what will happen in the stock market…or rather, I should say, I can easily imagine both positive and negative (potentially very much so) developments. I still lean toward the upside but I just don’t know how far POTUS might go with WHATEVER he is planning (or if there really is a plan)…or for that matter, if this whole thing hasn’t already gone too far. Several months ago (May 1st), I wrote that I thought all the worry about a trade war was Wall Street nonsense, and that I expected to see the Dow make new highs later this year...But I now see that I misjudged how far Trump would actually go in alienating the entire economic planet...and I am now quite uncertain as to what the outcome of his famous "dealmaking abilities” might be...To be honest, I can see the Dow quickly being 2000-3000 points lower...OR...having a resumption of the strong bull market that has been in force for years. All in all, I will say that taking out the recent 25,400 high (noted on the chart) would be quite significant and a precursor to perhaps lifting off into new all time highs...Otherwise, I can see this thing going in either direction. I have been short Eurodollars and Treasury Bonds for several years now…and while I still believe we are headed toward much higher interest rates (meaning lower Treasury Bond prices), the latest sideways action in Treasuries, and my perception that Trump’s actions could have consequences that move the market in either direction, I have this week decided to move to the sidelines with my Short Treasury Bond position…As I have indicated on the chart following, I still see Bonds going MUCH lower, but I would first like to see them BEGIN the move before re-committing funds to a short trade there. For what it’s worth, the fact that they have NOT gone lower since February has surprised me...and I can only conclude that it is possible that all the distress being caused by Trump’s Trade War may be resulting in safe haven buying…as well as the fact that Europe’s reluctance to raise their own rates is attracting money (buying) to our higher paying Notes and Bonds, thus providing support to US Treasury prices…I would add that the declines we have recently seen in various commodity markets could also be signaling that DEFLATION is now on the horizon (perhaps as an unexpected result of the trade war)…which would be unquestionably bullish for Bonds. The bottom line is, while I definitely lean to the downside in Bonds, I think the current environment could result in a sharp move in either direction, and I am basically willing, as noted on the charts below, to see them get STARTED on the downside before repositioning on the short side. In fact, SHORT GOLD AND SILVER ARE NOW THE TWO BIGGEST POSITIONS WE HAVE ON THE BOOKS HERE NOW…and I continue to believe that the YEARS of forever wrong brokerage house recommendations to buy these markets are about to see the bottom fall out. As I am always reminding you, all of the markets are nothing but a mob psychology game, that no prices are real but rather are a matter of perception, media garbage, and investor funds chasing and fleeing the latest hot Wall Street generated ideas. And like I said, “YOU HAVE TO OWN GOLD” HAS BEEN ONE OF THE UNANIMOUSLY TOUTED “STORIES” OUT THERE SINCE 2012…AND BY MY ESTIMATION, THE MONSTROUSLY OVERWHELMING MAJORITY OF BUYERS SINCE THEN ARE PROBABLY ALREADY LOSING MONEY…AND I BELIEVE, WITH NEW RECENT LOWS FOR THE YEAR, ABOUT TO FIND THEMSELVES LOSING A LOT MORE…THE END RESULT BEING THAT MORE AND MORE…AND MORE…OF THEM WILL SOON BECOME SELLERS AS GOLD AND SILVER SHOCK THE INVESTMENT WORLD WITH HOW BIG AND FAST THOSE TWO MARKETS CAN GO DOWN. As I have repeatedly noted, Gold does NOT rise and fall due to the classic supply & demand equation that are the case with traditional commodities. In my mind, 95% of Gold’s movement is based on emotion…and NOTHING else. As both of these markets drop into new lows for 2018, I continue to aggressively recommend new short positions. 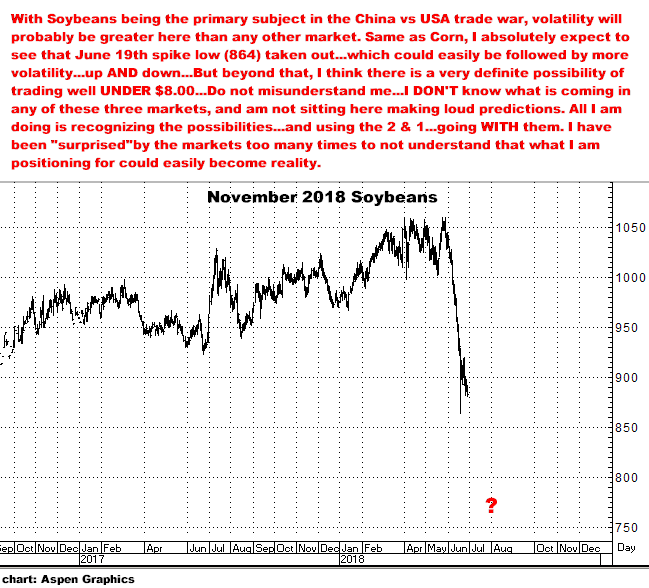 I am not deadset on remaining short Corn, Wheat and Soybeans…but I am in these trades with idea the decline could last well into Mid-August…Two reasons being that, as noted above, I DON’T think the Chinese will suddenly say, “We give in, Donald!”, and also, as Corn and Soybeans develop in the fields, more and more SELLING pressure will be coming from producers as their crops mature and they head towards harvest. Recognizing that weather, or positive developments on the trade war front, can immediately and sharply reverse any of these down moves, I am ABSOLUTELY using the 2 & 1 approach in all cases...When you get down to it, this strategy is PERFECT FOR EXTREMELY VOLATILE MARKETS. Give me a call if you are interested in anything here…or if you just want to talk. As ever, I always enjoy talking to all of you…whether we agree…or disagree.